My Two Blessings: Booking Through Thursday - Most unusual book. Booking Through Thursday - Most unusual book. My first thought was Frank Peretti - a christian novelist. The first book I read of his was "This Present Darkness"
It scared the living daylights out of me. It was the late 80's and I forget who told me about him, but I was into science fiction and fantasy and they suggested I read his book. Now I have a very vivid imagination, which is probably why I never went to see The Exorcist. My sisters went and ended up sleeping with the lights on for weeks. Well, this story is about a small town of Ashton that is being overrun by evil and the spiritual battle that takes place. What's different about it, is the unseen becomes the seen in the story and the characters see the demons and angels. There is one particular scene that takes place during a church service and the pastor can see the demons who accompanied some of the people attending and how the demons covered their ears so they couldn't hear what he was saying. 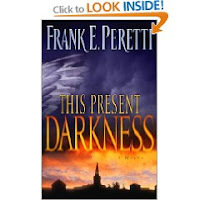 "This Present Darkness, by Frank Peretti, is among the classic novels of the Christian thriller genre. First published in 1986, Peretti's book set a suspenseful standard in spiritual warfare story-telling that has rarely been met by his contemporaries. Set in the apparently innocent small town of Ashton, This Present Darkness follows an intrepid born-again Christian preacher and newspaper reporter as they unearth a New Age plot to take over the local community and eventually the entire world. Nearly every page of the book describes sulfur-breathing, black-winged, slobbering demons battling with tall, handsome, angelic warriors on a level of reality that is just beyond the senses. However, Christian believers and New Age demon-worshippers are able to influence unseen clashes between good and evil by the power of prayer. Peretti's violent descriptions of exorcisms are especially vivid: "There were fifteen [demons], packed into Carmen's body like crawling, superimposed maggots, boiling, writhing, a tangle of hideous arms, legs, talons, and heads." This book is not for the squeamish. But for page-turning spiritual suspense, it's hard to beat." This novel totally stretched the boundaries of my imagination and it was a difficult read. However, I loved it and wanted more. I ended up reading all his books. I would have to say Frank Peretti is responsible for expanding my mind and opening me up to a whole new world of christian suspense and thrillers. Not for the faint-hearted. What usual books have you read lately? Click over to Booking Through Thursdays website to see what everyone else has to say. You're right -- This Present Darkness was very unusual at the time, and quite surprising.